Belgian mechanic destroys F-16: accidentally fired on the ground. 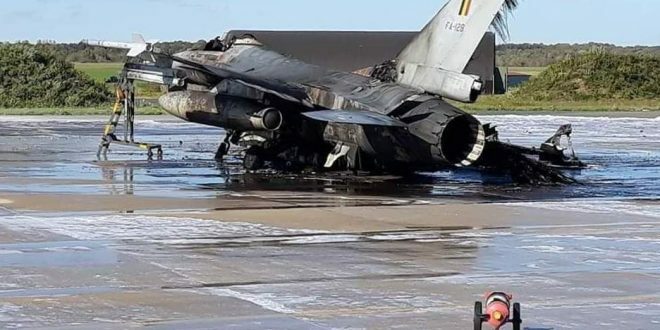 A Belgian Air Force F-16 has been destroyed and another aircraft damaged when the M61A1 Vulcan 20mm cannon on board a third F-16 was accidentally fired on the ground by maintenance personnel at Florennes Air Base in the Walloon area of Southern Belgium on Friday, Oct. 12, 2018. In a nearby hangar, positioned at the extension of the flight line, a technician was working on an F-16. It is said that by accident the six-barrel 20mm Vulcan M61A-1 cannon of that F-16 was activated. Apparently, the cannon was loaded and some ammunition hit the FA128. This aircraft had just been refuelled and prepared together with another F-16 for an upcoming afternoon sortie. After impact of the 20mm bullets, FA128 exploded instantly and damaged two other F-16s. It is the second time this year an accidental discharge of live aircraft weapons has happened in Europe. On Aug. 7, 2018, a Spanish Air Force Eurofighter Typhoon accidentally launched an AIM-120 Advanced Medium Range Air to Air Missile (AMRAAM) while on an air policing mission near Otepää in Valga County, southern Estonia. The incident occurred only 50km from the Russian border. ”Over the past two weeks, we employed three helicopters, five ground patrols and fifty-strong units of personnel to undertake the search on the ground. We also got help from the Rescue Board (Päästeamet) Explosive Ordnance Disposal Centre and used Air Force drones in the search,” Col. Valge added. “Despite our systematic approach and actions the location of the impacted missile has not been identified and all probable locations have been ruled out as of now,” Col. Valge concluded in the August 17, 2018 media release ten days after the missile was accidentally fired. Because strict weapons safety protocols, especially with live ammunition, are in place during ground handling it is extremely rare for maintenance personnel to accidentally discharge an aircraft’s weapon.